The History Society meet six times a year in the Chapel Schoolroom, New Street. Illustrated talks are given covering many different subjects, mainly relating to Weedon and the surrounding area, though occasionally from further afield. Meetings take place once a month on a Monday evening, commencing at 7.30 pm unless otherwise stated. Doors open at 7.15 pm. Visitors are always welcome with a donation of £2 at the door. Tea, coffee and biscuits are served. Summer outings include guided walks around neighbouring villages and visits to places of local interest. 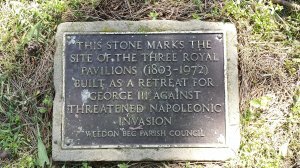 Other activities include collecting, recording and publishing matters relating to the history of Weedon Bec. Please contact Maggie Nicols after 30th April on 01327 340732.